My husband Howard was puttering around the backyard last weekend. He wrapped his hand around an errant clump of recently mown grass and lifted. The hot sharp jab left a stinger in his middle finger, which he carefully removed, trying not to squeeze more venom into his flesh. He never saw the insect who, no doubt, died after the attack. A week later, his finger is nearly normal. What do you think of when you think of garden pests? Some people think of the moles who ruin their lovely carpet of lawn. Google “moles” and see how many pages of articles there are about how to rid yourself of them. I have a friend who collects the fur from brushing his cats and puts it in the tunnels. He claims it makes the moles go away. You might be surprised to hear that moles aren’t all that bad for your yard. Their tunneling aerates the earth, which is good, and they don’t eat your bulbs—that would be the cute little chipmunks, mice, and voles. In fact, moles eat garden pests like slugs and grubs. Slugs can cause a bit of damage, although it’s hard for me to get over my delight as a child when I found “fairy paths” on the sidewalk. The mucus a slug excretes helps protect its foot when it moves. 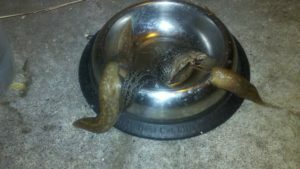 It has fibers in it that help keep the slug from slipping on steep surfaces, and it also helps other slugs of the same species locate each other. (It’s not like there’s a SlugMatch.com.) I have a foolproof way of catching slugs. Leave a cat food dish outside and check it at about eleven o’clock at night. Pests are the ones that ruin the leaves of our favorite plants, or the fruit of our favorite trees. The playfield near my house has a stand of twinberry (Lonicera involucrata) that is native. They are supposed to be hardy, and few articles warn of any particular risk of pest damage. Unfortunately, they seem to be vulnerable to leaf miners. Last year I saw leaf after leaf with the telltale serpentine pattern. This is where it’s good to have learned a little about Integrated Pest Management. You will want to come this Thursday, April 30th, when author and garden educator Lisa Taylor gives a lecture from 6 to 8 p.m. right here at the Kruckeberg Botanic Garden. Integrated Pest Management, or IPM, is not just one method, but rather is a four-tiered approach to pest management. It’s a way of getting the “most bang for the buck” so to speak, by deciding first how much imperfection we can tolerate (do we really have to do anything at all?) then figuring out exactly what pest or pests are causing the damage, at what stage in their life cycle they are causing it, and then using that information. For example, it is the larva of the leaf miner that eats out the inside of a leaf. Once we see the damage, it is really too late to do much about it for that year. The larvae are probably already grown up and gone. Killing the eggs would be good, but that target’s gone by. Killing the adults will prevent them laying eggs; but you can see that some thought needs to go into what to do and when to do it. IPA dictates that we prevent the damage in the first place; for example, by keeping our plants watered and sunned appropriately, so they are healthy, and perhaps by planting things nearby that the insects will prefer. I read somewhere that nasturtiums can be such a “trap crop”. It attracts aphids, and once a nasturtium is covered in aphids it can be removed and placed in a plastic bag and tossed in the garbage. Or you can plant things that attract beneficial insects that will eat the insects we don’t want. Oregon State University has a pocket guide on “Common Natural Enemies on Crop and Garden Pests in the Pacific Northwest” that might help. Do come to the lecture. You’ll enjoy it and you will learn a lot about how to take care of what you love. Please also come to the big Mother’s Day sale, May 8th to the 10th.